The Irish government was not happy with the "optics" of NI fishermen being taken to court in a row over fishing, its agriculture minister has said. Michael Creed TD was speaking in the Irish Senate as it discussed overturning a ban on reciprocal fishing rights introduced two years ago. In February, two County Down fishermen appeared in court for fishing inside the six-mile limit at Dundalk Bay. In 2017 the Irish Supreme Court revoked permission to fish these waters. The Irish navy seized the fishing boats. Taoiseach Leo Varadkar later promised to address the issue. Until access was revoked, Northern Ireland registered boats could fish within the six mile limit. The same rights were extended to boats registered in the Irish Republic to fish in Northern Ireland coastal waters, under a 50-year-old cross-border agreement. While the Irish authorities suspended access, boats from the Republic of Ireland were not stopped from fishing in Northern Ireland waters. Mr Creed said the legislation under discussion on Thursday was simply intended to reinstate something that had worked well for half a century. The Supreme Court had ruled that the agreement was an ad-hoc one and needed to be formalised in legislation. But the government could not get agreement to pass it because of political concerns about future fishing access arrangements post Brexit. A third of the value of the Irish catch comes from UK waters. Mr Creed said fixing the access issue would not sort out Brexit issues but it would be easier for the Irish government if they were not "standing accused in the court of public opinion of having a double standard". Sinn Féin Senator Pádraig Mac Lochlainn said the Supreme Court case had been prompted because boats registered in Northern Ireland, but owned by big multinationals, had "plundered" mussel seed beds cutting output from 29,500 tonnes in 2006 to 6,400 tonnes in 2016. 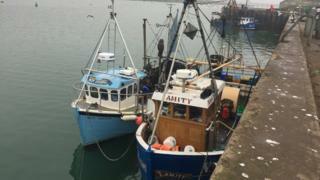 Mr McLochlainn said any opposition was not about legitimate County Down fishermen for whom he had great sympathy. But Mr Creed said corporate ownership of fishing boats was a fact of life on both sides of the border and to impose any restriction on ownership would be unlawful under both EU and domestic law. The minister said he intended to have the legislation through both houses of the Oireachtas by the end of March. He said if that didn't happen and Britain left the EU, it would make it much more difficult to achieve.